Hellblade: Senua's Sacrifice is incredible. Now, I could simply write that and walk away, saying exactly what there is to be said about this small team effort from Ninja Theory. This was a game made by a team barely over a dozen strong and starring, of all people, Ninja Theory's own video editor in the lead role. While I've reviewed Hellblade before, I've not done so on this site, and so, since this is my favorite game of 2017, It's getting a whole new review. The cold grasp of death had me. It breathed on my skin, calling out to me. The voices in my head were attempting to convince me that it was my own fault; I started to believe them. My hand was covered in darkness, a black rot that would not let me go. It had taken form, solidifying around my fingers and crawling up my forearm. I dropped to the ground, writhing in pain, screaming to anyone who could hear, but it was only myself and the voices in my head who were present to my agony. Eventually, the pain went away, it became more of a cold sensation, almost inviting, it came with a sense of calm. That's when the darkness took over and what remained of me was gone. This was the first time I died. Hellblade is an experience. It is also a discussion about mental health, a subject often considered taboo in many forms of entertainment, let alone one being addressed through a video game. While characters with mental health issues do exist in the industry, they are rarely ever positioned as the main protagonist and are often side characters usually there for a joke or a quick laugh at their expense. 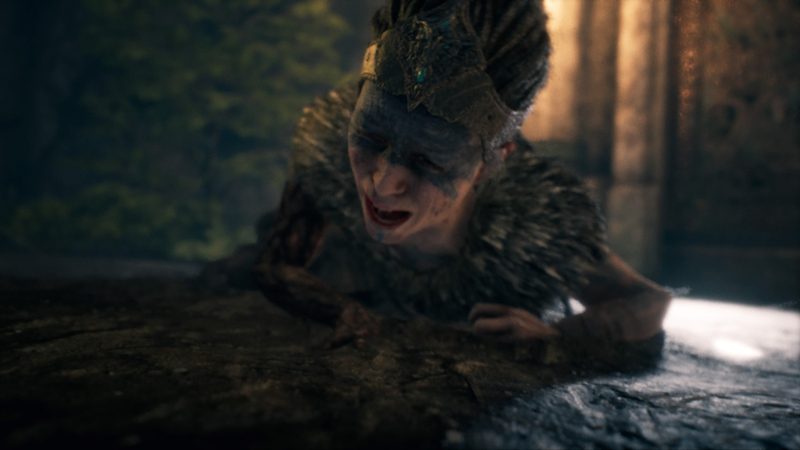 In Hellbade, you play as Senua, a woman suffering from Psychosis, which is an abnormal condition of the mind that involves a loss of contact with reality. It's also why Senua will hear voices and suffer delusions throughout the 8-10 hour journey. To treat the use of mental illness in their game with respect, Ninja Theory sought out two experts in the field; Professor Paul Fletcher from the University of Cambridge, and writer and psychologist Professor Charles Fernyhough from the University of Durham, an expert on voice hearing. Ninja Theory also received funding for the game from the Wellcome Trust, a biomedical research charity based in the United Kingdom. This agency not only provided creative support in the depiction of mental illness but helped the team get into contact with those who suffer from it. This group not only shared their experiences of living with mental illness but assisted the team in making sure the game was as authentic to the illness as possible, playing it in various stages of development and providing feedback. Hellblade is meant to be played with headphones and frankly, I consider them a requirement. Senua will hear multiple voices through the entire game and they are recorded through a process called Binaural Audio. This is a form of 3D sound recording to have the audio shift around the user in a 3D space, making headphones the perfect format for the illusion that these voices travel from ear to ear and are all around you. Voices will softly speak into one ear and then move behind you to continue the dialogue in another and its effect is remarkable. The voices each have various personalities and often will assist you in battle by shouting "behind you!" when a foe is about to strike, but often they will attempt to cast doubt on your efforts or blame you for your current troubles. The recording is so high quality that you'll often be convinced that someone is actually beside you and its effects are meant to be unnerving and make you feel uncomfortable. While the voices and the format of their use are played up a bit to enhance the overall gaming experience, much of the direction of their context here was based on experiences of those with Psychosis, those who hear voices all around them. While the character of Senua is created from bits and pieces of actual history, the look of the character was eventually based on Melina Juergens, Ninja Theory's video editor. During the early days of development, she was merely a stand-in for the character to assist in motion capture and eventually ended up taking on the role, despite her fear of acting. The 26-year-old German video editor had never acted in any real capacity and often would ask her co-workers to turn off the lights or to look away when she would act out some intense scenes. Despite the doubt of whether or not she could tackle the role, Juergens is a natural talent and shines as Senua, coming off both brilliant and uncomfortable, all in one package. This effort also rewarded her with numerous best performance awards, one of which was from aptly titled "The Video Game Awards", in a category packed with big named voice actors. I've never seen such a well deserved win and to put the icing on the cake, she was handed the award from the king of motion capture himself, Andy Serkis. Melina delivers frankly, the best performance I've ever seen in a video game. The rollercoaster of emotions that Senua goes through must have been beyond exhausting for the editor and you can witness much of her real-life performance through the numerous dev diaries on Ninja Theory's Youtube channel. 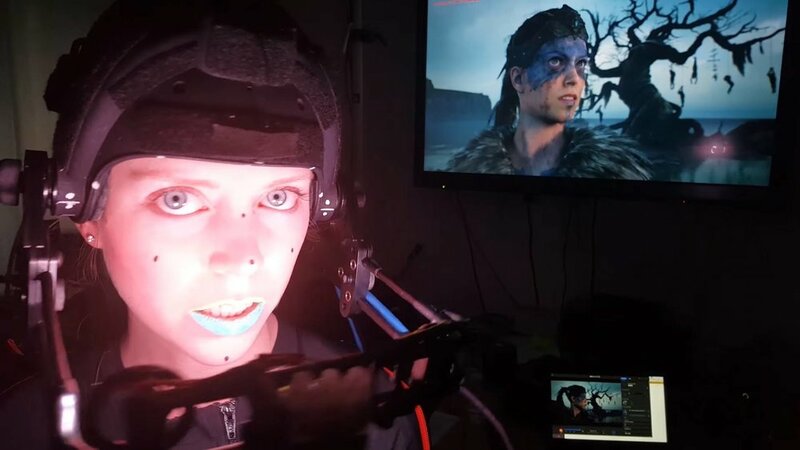 Every cry, roar, or burst of emotion from Senua is performed brilliantly and due to the process of digitally recreating Melina in-game; eerily realistic. Despite being a video game character, Senua feels real and frankly, she very much is. She has largely apparent flaws and her depiction shows a lot of her humanity. While yes, much of her is brought to life by Melina herself, much of what makes her such a compelling and engaging character is through a team effort of artists, writers, animators, and of course, those who provided guidance on the subject of her mental illness. Senua isn't just battling creatures and monsters, but the demon's in her own mind, the voices that cast doubt upon her every action. The subtle animations like the tremble of a lip, or the darting eyes when the voices are active, enhance the experience and can be a joy to just witness. Senua will defend herself from numerous foes, and while the enemy variety isn't far-reaching to any extent, the combat is extremely fun and satisfying. Her journey will take her to the gates of the Underworld, a place known to anyone who knows a bit of Norse Mythology as Helheim, or Hel. This journey for Senua is to save the soul of Dillion, the man she loves, and his head is contained in a sack that bounces against the backside of her hip through most of the game. The story is told mostly through her, the voices, and the few characters she will interact with during the game. You learn much of her own backstory as well, hearing about her religious zealot of a father to her kind and compassionate mother. What works really well for the story here is how naturally it is told and it never feels paced poorly or confusing in its execution. I had a clear idea of what was going on and it had its grip on me the whole time. The combat is a strike and dodge based system that can feel a bit too simple at first but when you start getting groups of enemies surrounding you, then it becomes a bit more chaotic. Senua will draw her blade when the battle starts and there are moments here where you'll wonder when the onslaught of foes will stop and then suddenly Senua will sheath her sword and you'll breathe a sigh of relief. While these moments can feel intense and feel as though the battle will never end, you still anticipate the next fight and look forward to it. The combat has a lock-on camera that will focus you on one enemy at a time allowing you strike or roll out of the way of incoming attacks. The combat feels very tight and polished in ways that I wished bigger budget hack and slash games would learn from. When it comes to the actual combat moves, you have the basic light attack, heavy attack, block, guard break, and dodge maneuvers that are typical of this style of game. There is no progression system or loot system that sees you collect gear or new weapons; you start with a sword and that is all you will wield for at least the majority of the game. If you run while attacking you can charge into enemies with a devastating blow that can deal some pretty good damage and this can become essential when enemies start spawning in left and right. During these moments you have a fraction of a second where they are vulnerable and it worked so well that it became part of my skill set of dealing with large crowds. Not every enemy can be taken down this way, however; as the shielded warriors require you to roll around them and find an opening to take them down. Apart from your strikes and a few melee attacks, Senua also has a mirror that can build up a focus meter to slow down time, allowing you to clean house quite easily with a steady assault of wild attacks. The game doesn't offer any sort of health bar for your enemies or Senua herself and instead opts to have visual signs of the current health available. This can be in the form of an enemy moving a bit more slowly or even limping, or a reddish hue around the screen when Senua is close to dying. The game warns you at the start that should Senua die too often that the black rot that is consuming her will eventually kill her and delete your save file. This was a topic that angered much of the community but was also praised by others, and I think the game has been out long enough for me to say this; it was never true. Senua can die as many times as you want and the game will continue going. The fact that this was a ruse was also something that didn't sit well with certain people and it was a confusing message during the initial first few weeks of release. 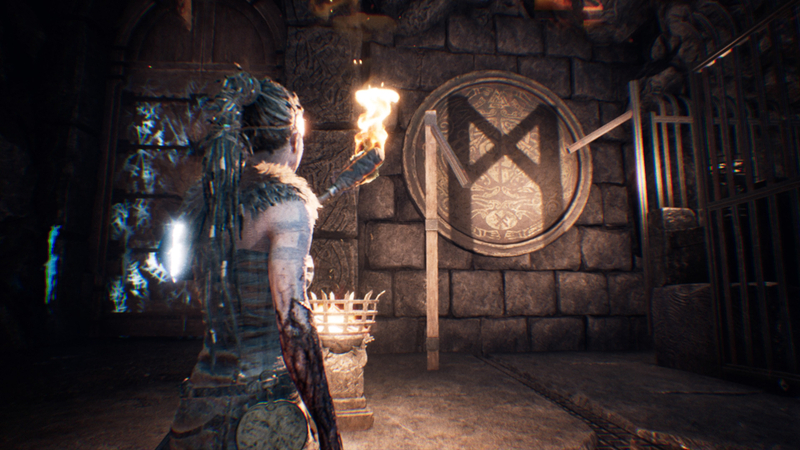 Hellblade does offer a sampling of puzzles amongst the combat and exploration and a few of them are pretty impressive. Often to progress through a ruin-locked door, you'll need to find shapes around the environment that when looked at from a certain viewpoint, will form that shape. My favorite puzzles in Hellblade were the archways. These were doorways that would have an altered version of the environment on the other side and sometimes you would need to manipulate something in one world and then return to the other to benefit from it. The one example that is easy to give is unlocking a door through one archway and then backtracking through the arch to use the now opened door, which was inaccessible before. This is really only used in one location, but it stands as a highlight of design for me. Despite the game being made by a very small team, you wouldn't think so based on the look of it. Hellblade is a gorgeous game that has all the appeal of a big budget AAA release but was made on a fraction of the budget. Ninja Theory also chose to self-publish this game and so far, it is a digital-only release on PlayStation 4. 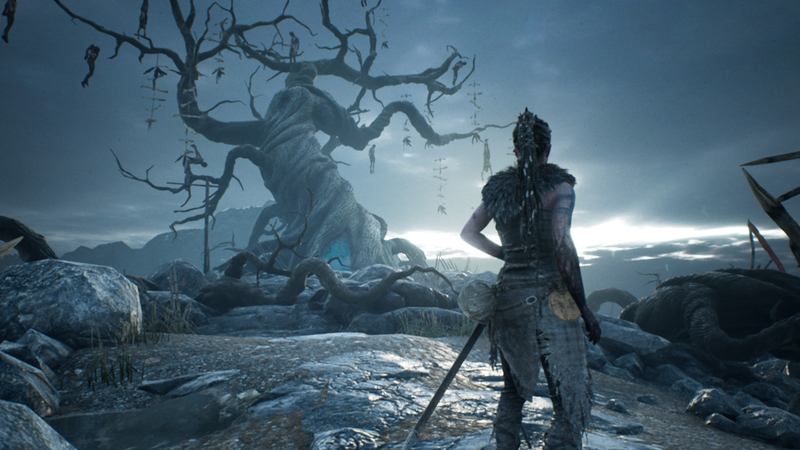 Hellblade: Senua's Sacrifice is hands down my favorite game of 2017 and one of the best games I have ever played. The subject matter can be difficult to tackle, especially if you suffer from or know of people who have some form of mental illness. Ninja Theory easily treated this game as a passion piece and took the time to learn about mental illness to ensure it was well represented and respected in the game. Melina's performance as Senua will always be my favorite aspect of the game, but combine that with incredible combat, great visuals, and a wonderful story, and you have my #1 game of 2017. If you know of anyone who suffers from some form of mental illness, or if you yourself require help, please click here. HELLBLADE: SENUA'S SACRIFICE WAS PURCHASED BY THE REVIEWER. ALL SCREENSHOTS WERE TAKEN ON PS4.